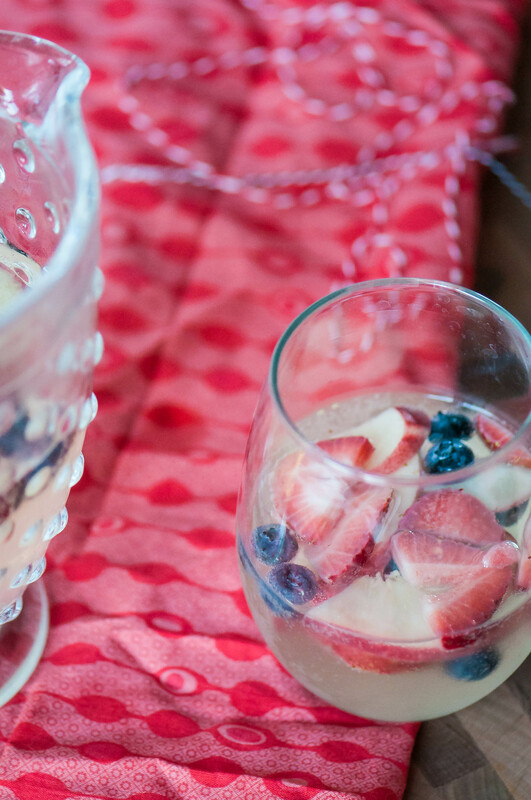 Make the 4th of July even more festive with this Red White and Blue Sangria. Strawberries, blueberries, peaches, white wine and sparkling lemonade all combine to create a delicious, refreshing drink that screams America. I’m at the library writing because my kids are attending VBS this week (hallelujah praise the Lord) and somebody two rows down from me has been on the phone for about 15 minutes now talking about serving papers and Facebook gossip and cursing. I’m having a very hard time concentrating here people. The library is my quiet, happy place. It’s rude to talk on the phone in the library, right? Yes, I can put headphones on and listen to music but even that can be distracting to me so that’s why I come to the library rather than a coffee shop. And there are children around for goodness sake. I could use a glass of this sangria right about now. Is 10:30 too early during the summer? Yes, you say? 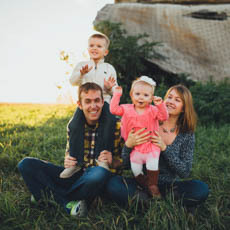 Why do you have to go being all responsible? Let me live a little. Well, when it’s an appropriate time to consume sangria this has got to be in your glass. It’s filled with strawberries, white peaches and blueberries making it the perfect festive beverage to serve at your 4th of July barbecue. My goal every summer is to turn all the things patriotic. My red, white and blue beverage and dessert game is on point guys. The general rule of thumb for sangria is to use a dry wine since the fruit and additional liquids usually add a good amount of sugar. I always prefer a sweeter wine but I am a fan of Rieslings (this one is my favorite) so that’s what I went with for this sangria. But you do you. If moscato is your favorite then use it. I mean, it’s wine and fruit and sparkling juice so I really don’t think you can go wrong. When I was shopping at my new favorite grocery store I discovered sparkling lemonade and knew it would add a delicious tartness to this red white and blue sangria. It’s so good guys. Trader Joe’s carries their own variety of sparkling lemonade too. If you can’t find any, you can replace it with lemon lime soda. It won’t be quite as tart and crisp but it’s still a tasty option. The sangria tastes best if you can combine the wine and fruit a few hours before serving. That way the flavors have time to mingle and the wine infuses with fruity goodness. Right before serving, mix in the chilled sparkling lemonade (or lemon lime soda if you can’t find it) to ensure you don’t lose the carbonation. If the kids want to get in on the fun, whip up a batch for them by simply replacing the white wine with white grape juice. Make sure to label them very clearly so there aren’t any mix ups. Place fruit in bottom of pitcher or punch bowl. Add white wine and stir. Place in refrigerator for 1 to 3 hours to allow flavors to mingle together. Right before serving, gently stir in the sparkling lemonade (or lemon lime soda).